Alternative Energy, LLC > Solar Energy > Florida Solar Panel Law Passes Requiring Homeowners To Go Solar Now! 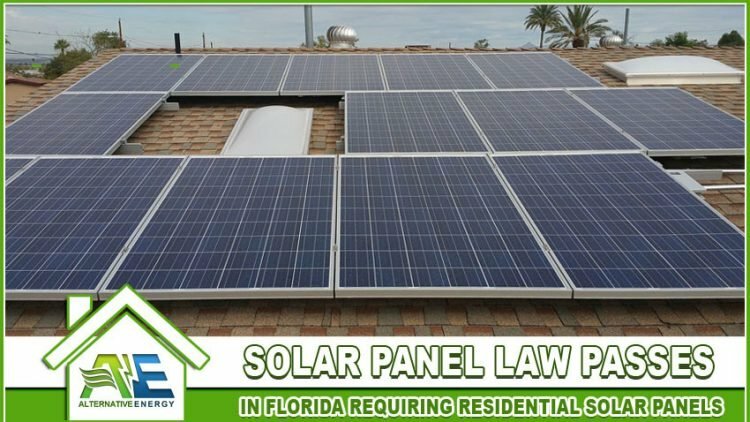 South Miami Florida’s solar panel law just passed on 7/18/2017 requiring new home builders and homeowners to install solar panels. The city commission and commissioner Josh Liebman approved it by a vote of 4-1 on Tuesday night. This law goes into effect Sept 18th, 2017. For example: If you are planning on building a home in Miami Dade County or Broward County any time after September 18th, 2017, you need to install solar panels. This also applies to residential remodels or renovations that expand the home by 75% or more. For example: Let’s say you have a 1,000sqft home and want to add an additional 1000sqft addition, you would need to install solar panels because you are adding on a 100% increase to your home. You would only be able to increase your home by 749sqft without having to install solar panels. Any residential new construction home build will require 2.75kw per 1,000sqft of living space or 175sqft of solar panels per 1,000sqft of living space. If your home is built under trees, the shaded areas of your roof may be exempt from this rule. Home remodels, renovations or additions that replace existing or extend structure by more than 75% are required to install solar panels. Here at Alternative Energy, LLC we want homeowners to be happy with the decision to go solar and that’s why we decided to create the South Miami Solar Assistance program. Read more about our super helpful program below. Alternative Energy, LLC Energy understands the challenges homeowners face when making energy improvements, let alone facing a forced situation, and that’s why we’ve decided to make it easy for you to go solar in South Miami with NO MONEY DOWN solar installation! No money out of pocket and lower monthly payments than what you are currently paying. Yes we said it! NO MONEY DOWN Solar installation for all residents living in South Miami, Florida! This program will actually make it beneficial to go solar with no money out of pocket. You will literally be paying less than you are paying now with solar installed! After Alternative Energy, LLC you will be thanking commissioner Liebman for forcing you to do this!! Florida voters, last year, approved a state law to lower taxes on solar systems to help make solar more affordable in FL. There are also other incentives that will help you pay off your system besides our program. Think the new Florida Solar Panel Law is a nightmare? We can turn that frown upside down with NO MONEY DOWN solar installation in South Miami, Miami Dade County, Fort Lauderdale, and Broward County, Florida. Give us a call today at (480) 744-1803 or fill out our contact form for a free quote.